Free or Reduced hot lunch is sponsored through the US Department of Agriculture in conjunction with the National Schools Lunch Program. St. John participates in this program, and if your family qualifies, it is as simple as filling out a form! Who qualifies for Reduced Fee Hot Lunch? You can download a sample form from the USDA web site for review, but please stop at the school to pick up an application. 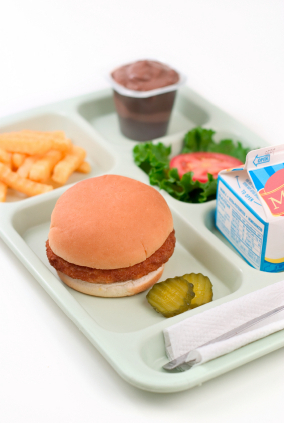 You can apply for reduced fee hot lunch any time during the school year. You can find out more about this program from the USDA web site. St. John Lutheran School is committed to providing healthy, hot meals to students who choose to purchase meals at school, but due to the size of our school we believe it is important to take care of debts in a timely manner. In order to continue to provide students of our school with the best possible meals and service the following procedures regarding unpaid meal charges (negative lunch account balances) will be implemented immediately. We will send a letter to the parents/guardians of free and reduced meal students when the account balance exceeds negative five dollars (-$5.00). If there are questions on how to monitor your account, please contact the office. Free and reduced meal students with account balances of negative five dollars (-$5.00) will only be able to purchase a meal and will be unable to purchase snack milk until the balance is paid or arrangements are made with the office. Parents/guardians will have 5 days to pay or make payment arrangements from the date the account first reaches negative five dollars (-$5.00). Free and reduced meal students, who have not paid their negative account balance or made payment arrangements after 5 days, will receive an alternate lunch until the account is brought positive. The alternative meal that complies with USDA requirements for lunch is a cheese sandwich OR peanut butter/soy nut butter and jelly sandwich, fruit and milk. We will send a letter to the parents/guardians of paid meal students when the account balance exceeds negative ten dollars (-$10.00). If there are questions on how to monitor your account, please contact the office. Paid meal students with account balances of negative ten (-$10.00) will only be able to purchase a meal and will be unable to purchase snack milk until the balance is paid or arrangements are made with the office. Parents/guardians will have 5 days to pay or make payment arrangements from the date the account first reaches negative ten dollars (-$10.00). Paid meal students who have not paid their negative account balance or made payment arrangements after 5 days, will receive an alternate lunch until the account is brought positive. The alternative meal that complies with USDA requirements for lunch is a cheese sandwich OR peanut butter/soy nut butter and jelly sandwich, fruit and milk. Lunch accounts must be current for students to travel to Wisconsin Dells for the end of the year trip.